286 ft 3-in long, with a beam of 41 ft 2-in. SHIPS’ figureheads are something of a craze. There are many people who delight in the picturesque features of figureheads and their connexion with the past, but few realize how much they meant to the old-time sailor and what an important feature the figurehead was in sea life. Yet investigation into shipping history reveals its value. At a time when the least insubordination in the Fleet was punished by the cat-o’-nine-tails, this reply produced no ill result for the tar. The officers knew of, and no doubt sympathized with, the feeling on the lower deck throughout the Fleet, and probably thought much the same themselves. Regarded as the finest in the Navy when the ship was built in 1756, this figurehead represented George II in heavily gilded Roman armour, with a red cloak and helmet-crest, mounted on a rearing white horse. Every man in the ship loved and took a pride in it, and interference by the afterguard was apt to be dangerous. It was a wise captain who knew when to tauten up his men by referring to the figurehead, but it required courage for a frigate captain to make this speech in the late eighteenth century: “Now, I tell you what it is, my lads. Unless you are off those yards and the sails are hoisted again before any ship in the squadron, by the Lord Harry, I’ll paint the figurehead black!” The threat gave his ship the best time in the exercises. Then there is the incident recorded by Captain Marryat in Peter Simple, one founded on fact, as were most of his novels, when the crew of the Rattlesnake, disgusted with the cowardly retreat of Captain Hawkins, cut off the figurehead of the serpent with its fangs. 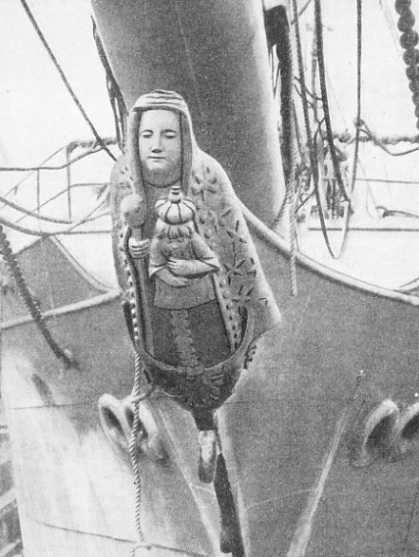 Not only had the figurehead a sentimental significance for the crew, but it was also an object of superstition. HMS Atlas, a fine three-decker, was launched during the War of American Independence in 1782. Because of an error in design, the figurehead, representing Atlas supporting the World on his shoulders, was too high to permit the bowsprit to be fitted, so part of the globe had to be cut away. That part included the American colonies, and its removal was regarded by the sailors as an omen. In comp-aratively modern days a sailing ship that generally ran regularly to Sydney was ordered to Brisbane for one voyage, and when passing Sydney met with a succession of baffling head winds. Old shellbacks in the crew carefully blindfolded the figurehead with a tarpaulin until they were safely past their usual port. As another instance of the way in which the nineteenth-century merchant seaman regarded the figurehead, the blue streak painted round the hull as a sign of mourning for a dead owner was carried over the figurehead only as an exceptional tribute to a kindly master who was loved by his forecastle hands. When this was done it always attracted full attention. The enthusiasm of the sailor was apt to outrun art, both in the design of the figurehead and in its colouring. To the student this only serves to increase the human interest, although to those who do not know the circumstances the work may seem merely garish. Scroll work and “fiddle” or “billet” heads - the former curling inwards, the latter outwards - were at one time only tolerated in conjunction with a figure. The scroll work was generally in the form of the trail boards which connected the figure with the hull of the ship and which could provide the graceful curve that made all the difference. To the sailor they were just “gingerbread”, and nothing more; it was the figure that counted. The origin of the figurehead is one of the many nautical mysteries, but it goes back far into the past. It seems to have been founded in a mixed desire to conciliate a deity and to terrify an enemy; the idea of decoration probably came far later. Probably the earliest known form of figurehead is found in the prehistoric ship of ancient Egypt. The ends of Egyptian ships came up in a graceful curve, taking the form of a lotus stem - perhaps the origin of our technical phrase “stem” - surmounted by a leaf. The earliest known Roman ships had figureheads, as had those of the Phoenicians. At a later date the carving of the heads on Viking ships was grotesque in detail, but their setting was remarkably graceful with the sweep of the rail. The ships of the Norman conquerors of England were similarly fitted. For a period in the Middle Ages the figurehead was eclipsed, as the necessity for every ship to be able to fight and the fitting of the forecastle platform left no room for the figure to rear itself proudly as it did in the long ships. Where it could be fitted at all it took the form of a rather mean serpent’s head or similar object placed under the platform. More often the desire for decoration had to be satisfied by the use of hull paint and by the shields (pavises) of the knights who were fighting on board. Later wooden reproductions of the shields called pavisades were placed in permanent position round the rail and satisfied the desire for decoration. Curiously enough, the tradition of the figurehead does not appear to have been affected in the least by this period of suppression. This shows the hold the figurehead had over the seamen’s minds, for there was no reading and little or no illustration to keep it alive. 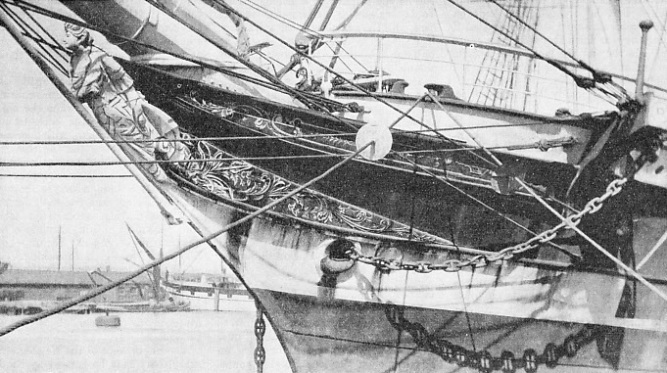 As soon as the development in ship design superseded the old built-on forecastle by its incorporation as an integral part of the ship, and the bow became more important in the desire to improve the balance of the canvas, the figurehead seems to have returned at once in all its former importance and more. By Tudor days it had reached a high level, and the influence of the Mediterranean galley on the fighting ships of Northern Europe resulted in finishing off a ship’s bow with a square bulkhead, leading forward to a big “beak”. This formed the above-water ram in a vessel propelled by oars and was ideal for the purpose of an elaborate figurehead. In these earlier types the figurehead did not stand alone. Its decoration was a part of, and carefully in keeping with, the wreaths round the gunports and the elaborate decoration of the stern, which, to the marine artist, although not to the seaman, was regarded as being of more importance than the bow. The French in particular were successful with this combination and were inclined to look down on British artists. SPANISH FIGUREHEADS were often elaborate and of a religious nature. 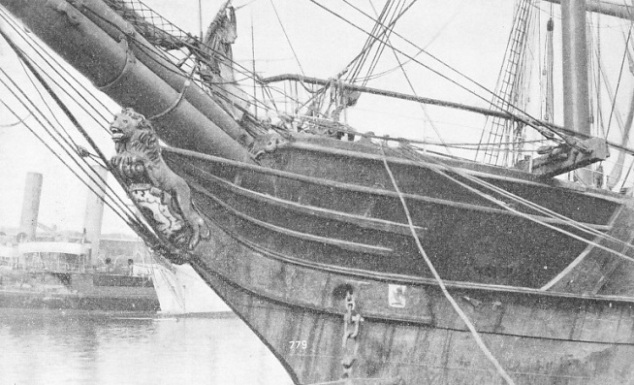 This photograph shows the figurehead of the Ama Begonakla, built on the Clyde in 1902 for Spanish owners, and registered at Montevideo, Uruguay. A four-masted barque of 2,516 tons gross, she was bought by Devitt and Moore in 1910 and renamed the Medway. She became a cadet training-ship. In 1918 she was converted into a motor-driven oil-tanker and renamed the Myr Shell. In 1933 she was broken up. In the reign of Henry VIII the lion became the general British figurehead, and, with few exceptions, remained popular until the end of George II’s reign. It was borne by such famous ships as the Great Harry, Elizabeth’s Victory and Sir Richard Grenville’s Revenge, in the early days of the beak bow. In these vessels the figurehead took the form of a heraldic lion couchant or gardant. When he ascended the English throne James I introduced the Scottish lion rampant, with a Royal Crown. Cromwell eliminated the Crown, but Charles II restored it. He began also the custom of varying the figurehead for all first-rates, although the lion remained for ships of all other types. By Stuart days the beak head had become modified, breaking away from the galley tradition, so that the lion rampant at the end of a false stem gracefully curved became part of what was known as “the sweep of the lion”. The decorated trail boards were given an elegant curve that remained unaltered for many years, even if it was far less suitable for many of the heads which were later fitted to it arid had a tendency to put them into a strained attitude. Some prominent exceptions to this lion figurehead are worth noting. James I’s ship the Royal Prince, built in 1610, had a figurehead of Prince Henry, which was regarded as a pleasing innovation. The Sovereign of the Seas of 1637, the most famous fighting ship of her day, whose decoration had accounted for one-sixth of her total cost, had a wonderful head of King Edgar trampling on seven kings, with a rather incongruous backing of Cupids and statues of the Virtues. The rich decoration of this ship had such a hold on popular fancy that even Cromwell was unable to enforce his order that all ships of the Navy should be painted a “sombre black”. He had to leave her in her original state. She earned the nickname of “The Golden Devil” from her Dutch enemies. Cromwell’s order cut down the decoration of hulls and sterns, but he appreciated the value of the figurehead and copied the scheme of the Sovereign of the Seas when he built the Naseby. King Edgar’s figure on the horse was replaced by Cromwell’s figure trampling on the fighting men of six nations. Other Commonwealth ships were given somewhat similar heads, but after the Restoration these were cut off and sold as firewood, being ceremoniously burned on Coronation night. To judge from contemporary prints, and from the example preserved in Holland as a relic of the Medway raid, these seventeenth-century heads were masterpieces of the carver’s art. This might be expected, when artists such as Grinling Gibbons were willing to carve them. The increased variation in the big ships introduced by Charles II added interest. William Ill’s 100-guns Britannia was the first to carry the Royal Arms as a figurehead, with elaborate scrolls and heraldic devices, a fashion which later became popular. In the mid-eighteenth century the lion went out of fashion for ships of the second rate and below, and its place in British ships was taken by full-length figures. These were not always an improvement. About this time classical names became more common in the Navy. They were often borne by French prizes whose particularly gallant resistance had earned them the compliment of their names being retained on the British list. In such ships appropriate heads were often charming, but other vessels were given effigies of princes, politicians, or even actresses whom it was desired to compliment. In the smaller types, fiddle and scroll heads were generally considered sufficient in official circles, but their captains often went to the expense of replacing them with something more decorative and inspiring. The heads of French ships were generally more artistic and appropriate than the British. The Spaniards were noted for wonderful and elaborate groups of religious figures. In the eighteenth century the Admiralty made several efforts to abolish the figurehead because of its cost. In this it failed, but much was done by pointing out to the common sense of the sailor that a heavy figurehead projecting over the bow of a sailing ship was a serious handicap to her sailing qualities. To lighten it without impairing its sentimental value, the figurehead was frequently carved out of soft wood, which gave it a much shorter life and robbed us of many examples. Similarly, the Admiralty attempted to restrict the colours to gilt or white, but since the bluejacket preferred something in more than natural colours, the authorities were tactful and often turned a blind eye. It was during the French wars between the middle of the eighteenth century and the fail of Napoleon that the figurehead attained its greatest sentimental height. The whole fleet at Trafalgar noted the fact that King George III led his ships into action as the figurehead of Collingwood’s flagship, the Royal Sovereign. It was regarded as an excellent omen when she got into action before the Victory. When the famous Captain Death built his privateer, the Terrible, perhaps the best known under the British flag, he selected a skeleton as the figurehead. Surcouf’s French corsair Revenant carried a corpse. 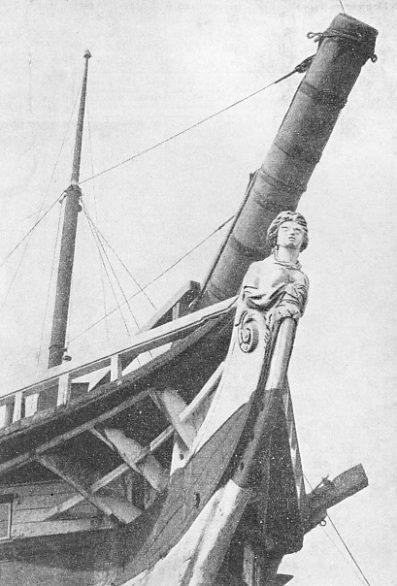 The original figurehead of the Victory may be seen to-day in the restored ship in Portsmouth Dockyard. Not all the figureheads made such an appeal, and many ships were cursed with figures of purely political interest. The British Navy did not alone suffer, as witness the history of the United States frigate Constitution. This vessel has a similar sentimental interest for Americans as the Victory has for us, and is affectionately nicknamed “Old Ironsides”. Her figurehead was originally that of Hercules, signifying the strength of the union and the power of the law. In 1807 it was changed for one of Neptune, and during the war of 1812, when the ship won her proudest bays, she had a billet head only. In 1833, during Andrew Jackson’s candidature for the Presidency, his portrait was fitted into the old ship as a figurehead, but so great was the outcry against it and so threatening the situation that a special guard was placed over it. The malcontents, however, contrived to saw the head off one night and make off with it. The 1,000-dollars reward offered for information was never claimed, although the perpetrator later revealed himself. The ship carried this mutilated figure for more than a year when, the outcry having died down, the portrait was secretly replaced. The abolition of the beak bow after Trafalgar, where many casualties were caused by its faults, reduced the opportunity of the figurehead and it became much simpler, especially in its trail boards and supports; but the interest was taken up by the Merchant Service. Until the end of the Napoleonic wars East and West Indiamen carried figureheads, but few other merchant ships had more than a scroll or fiddle. With postwar improvement at sea, more attention was paid to the external features of ships, especially those which had a public appeal. The fine lines and long swan bows of the clippers gave a good opportunity, and every advantage was taken of them. There was far wider variety of choice with merchantmen than with men-of-war. Perhaps the most popular form was a female figure with outstretched arms, her draperies blowing aft and merging into the lines of the hull. One of the first protests against this type was made by Captain Rossiter, an American, who, in building the Atlantic packet Queen in the ‘forties, installed a full-length portrait of Queen Victoria, but insisted that her draperies should hang down. He said he would not have his ship looking as though she never encountered anything but a head wind. About that period merchant ships’ figureheads attained a high standard and specialist carvers got good prices for their work. The figurehead and its trail boards were almost the only decoration to the ship’s hull - aft there was no more than a scroll - and the carvers had wide scope for their ingenuity. A CREST AND FIGUREHEAD OF A LION RAMPANT adorned the wool clipper Cimba, a full-rigged ship of 1,132 tons gross. Her owner was A. Nicol, whose private crest, a lion rampant, may be seen in this photograph on the shield in the Cimba’s head and abaft the hawse-pipes. 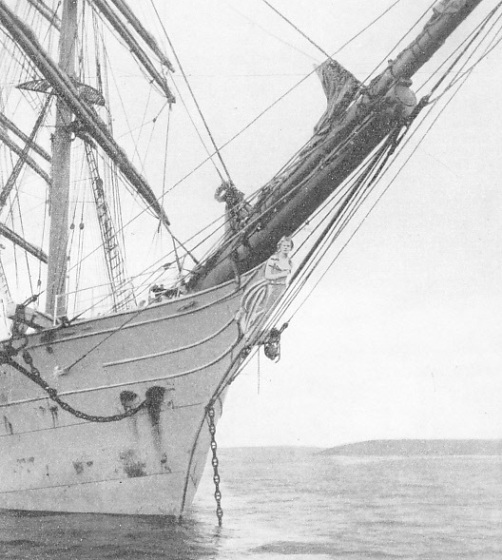 Built at Aberdeen in 1878, the Cimba was sold to Norwegian owners in 1906. She was then engaged in the timber trade and, with her splendid figurehead, was often to be seen in London Docks. The Cimba was 223 feet in length, with a beam of 34 ft 7-in. The clipper Styx had a full-length figure of the Devil on her bow. La Hogue, of 1855, reverted to the lion rampant, which also appeared on her owners’ house flag. The Nightingale had a beautiful portrait of Jenny Lind, the “Swedish Nightingale”. This figurehead unfortunately remained in position when the vessel had degenerated into a particularly unscrupulous slaver. John Willis, the shipowner, was a Scotsman and a fervent admirer of Burns, so that when he bought the East India Company’s frigate Punjaub and converted her into the clipper Tweed, he installed a beautifully carved head of “Tam o’ Shanter”. Her consort, the famous Cutty Sark, had the figure of Nanny the Witch, with her hand stretched forward to seize the tail of Tam o’ Shanter’s horse. All Corsar’s ships had the flying horse, which was appropriate in the Pegasus only. Many shipowners installed their own portrait or that of one of their family. With the Norman Court that was justified, for the young member of Thomas Baring’s family, who was honoured, was a beautiful and graceful girl to whom the carver did full justice. But when an owner decided to honour Samuel Plimsoll, the sailor’s friend, in the ship named after him, and when Mr. Bates christened a vessel the Bates Family and decorated her accordingly, the effect was less happy. Continental owners were particularly fond of figureheads of themselves or of their business friends in frock coats and top hats, with incongruous results. There were many British examples of this also. When James Baines, owner of the Black Ball Line of clippers, ordered the ship James Baines of Donald Mackay of Boston, he insisted on his own figure being carved. As he was a redheaded, snub-nosed, pugnacious-looking little man, the effect was unflattering and led to some coolness with Mackay. As a peace offering, Baines named the next ship Donald Mackay and offered the builder the chance of appearing on her bow in a top hat. The offer was not accepted and she went to sea with a finely carved Highlander in the Mackay tartan. AFTER TRAFALGAR, in 1805, the French warship Duguay Trouin was captured by the British and renamed HMS Implacable. Her figurehead was in keeping with her new name. Immediately below the bust may be seen the “fiddle”, a decoration that had to suffice for many ships. A similar decoration executed in the opposite direction would be known as a “scroll”. Donald Mackay, as befitted a man whose life was wrapped up in the ships which he built, was far more particular over the figure-head than most of his American colleagues, although the traditional American stem, with its particular shape and angle, would not always permit the figurehead to sit gracefully. The Flying Cloud had an angel blowing a trumpet, the famous Great Republic a huge American eagle with outstretched neck. The Champion of the Seas had a particularly happy sailor’s figure in the “No. 1 Rig” of that day - blue jacket, tarpaulin hat, check shirt and white trousers, with a shiny black belt and a huge brass buckle. It will be noted how many of these heads had outstretched arms which were generally unshipped and stowed away below as soon as the ship got to sea to avoid risk of their being damaged. In some companies the trail boards also were removed. Killick, Martin and Company made this its rule after one had been washed off an outward-bound clipper in the English Channel. It was deposited on the Sussex coast, leading to the belief, which could not be contradicted for many months, that the ship had been lost. While the figureheads of merchant ships were being developed and were attaining a high standard, it was proving increasingly difficult to retain them in men-of-war. The first ironclads were built with clipper stems and were given remarkably fine heads - those of the pioneer Warrior and the Black Prince, of 1860, cost £2,000 each - but the ram bow soon became the fashion and it was more difficult to fit an attractive figure. The Union Jack or Royal Arms, with a long scroll abaft them, elaborate in the ‘sixties but getting smaller and smaller in each successive class, took the place of a figure. Even this was abolished by Admiralty Order in the ‘nineties. The latter days of the nineteenth century saw the clipper stem disappear in warships and in nearly all merchantmen. With it went the figurehead. Some efforts have been made to restore it or to find a substitute. When the US battleship Massachusetts was built in the ‘nineties the State of that name presented her with a fine figure of Victory in relief, which was fixed between the thirteen-inch guns on the face of the fore turret. When the Hamburg-Amerika Line built the Imperator, later the Berengaria, in 1912, as the biggest ship in the world, it gave her a huge and incongruous eagle figure on the top of her straight stem. The figure was soon removed. Nowadays the figurehead is almost confined to the few surviving sailing ships, still fewer clipper-stemmed steamers, and a fair number of yachts. But the modern cruiser’s curved bow, gradually getting near to the old clipper stem, is offering a chance of revival and there is talk of putting figureheads into French and Italian men-of-war. One or two of these already have eagles with spread wings which are more effective than the municipal coat of arms which appears in the eyes of German ships. It is the old examples, however, which are treasured. In the Scilly Isles there are many figureheads taken from ships that have come to grief there, although many of them have rotted and disappeared. A well-known firm of Thames shipbreakers has its wall on the river bank decorated with some fine examples of figureheads. The Royal Dockyards at Portsmouth, Devonport and Chatham have fine collections, in the open and in their museums, and there are many examples mounted on the walls of small shipyards round the coast, or in marine stores. 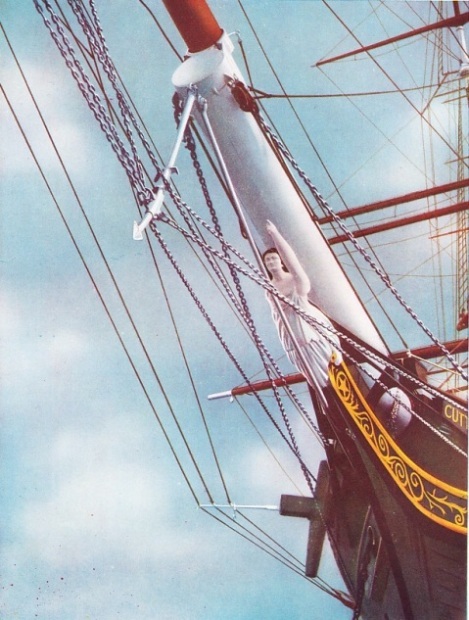 THE FIGUREHEAD OF THE FAMOUS CUTTY SARK represents the figure of Nanny the Witch. A contemporary ship, the Tweed, belonging to the same owner, had a figurehead of Tam o’ Shanter. For some years the Cutty Sark has been preserved in Falmouth Harbour, Cornwall. A clipper ship with a displacement of 1,970 tons and a gross tonnage of 963, the Cutty Sark had an iron frame planked with wood. She was launched at Dumbarton on the Clyde in 1870 for Captain John Willis. In 1875-76 she raced against her rival clipper, the famous Thermopylae, from London to Australia. She lost the race on the outward journey by seven days, but arrived home seventeen days before the Thermoplyae. The chapter beginning on page 47 tells the story of these famous clipper ships. The Cutty Sark was 212 ft 6-in long between perpendiculars with a beam of 36 feet and a depth of hold of 21 feet. This illustration was also used as the cover of part 25.